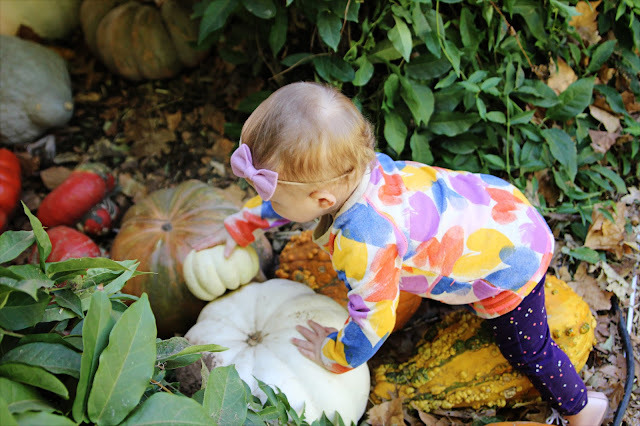 The Lady Okie: Obligatory Pictures of My Baby with Pumpkins. Because Fall. 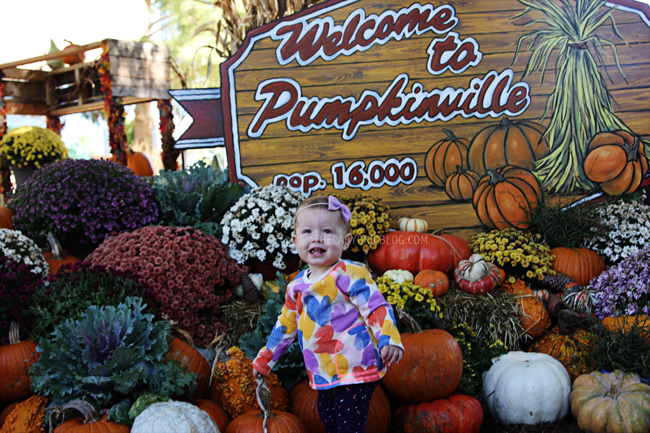 Obligatory Pictures of My Baby with Pumpkins. Because Fall. So I know I said I don't like photo dumps. Buuuuut, it's happening. Because pumpkins. And cute babies. And fall. And did I say cute babies? 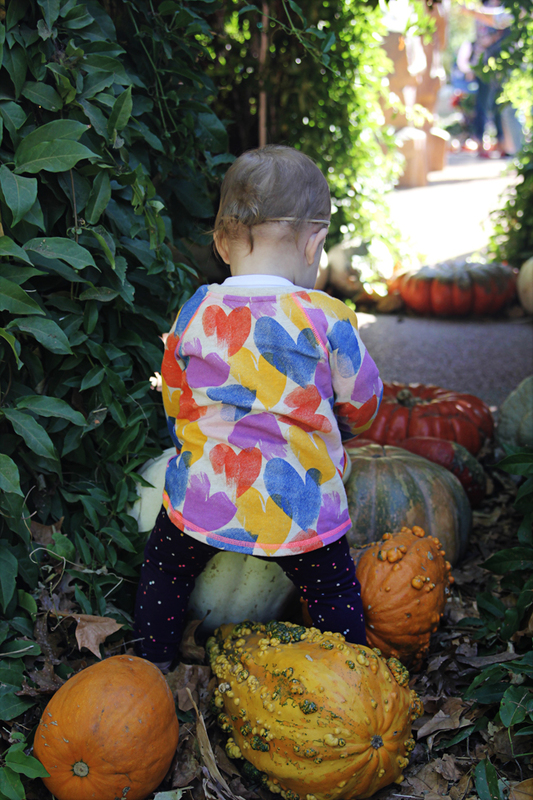 Over the weekend, Jordan and I took R to Pumpkinville, which is hosted in the kid's garden in downtown OKC. I happened to come across a sign for Pumpkinville during one of my lunch walks at work, and I told Jordan we were absolutely definitely going. We honestly weren't too sure how much R would really be into it at 14 months old, but she loved it, and it was so much fun. She's only really started walking pretty much full time within the last two weeks. We just let her take the lead and walk where she wanted, and it was really fun to see her get excited about the hay bales and pumpkins. She also got excited about metal chairs, and once she stopped to play with a sprinkler head, but anyway. There were all these different paths lined with pumpkins, and even though there were a lot of people, it never felt crowded. 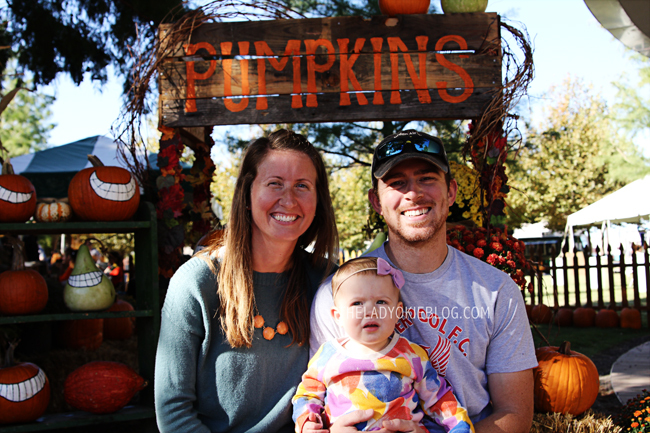 There were also a lot of different places to sit with pumpkins and photo ops, and they really did a great job setting it up! It was $6 per person to enter (under 3 was free), and we thought it was totally worth it. I'm already looking forward to next year! My favorite part of Pumpkinville were all the different types and sizes of pumpkins. They had this giant wall of all the different types lined up, which R liked and I thought was really cool! R is big on climbing on things right now, and she hopped up on that rock all on her own and Jordan had to race over there and make sure she didn't topple off. And yes, you probably noticed she kept her hairbow on! When she's sufficiently distracted, she forgets about ripping her bows off and eating them, which means people don't mistake her for a boy and I'm a happy mama to be able to put my bow obsession to good use. There's really no end to my thankfulness for my little family. Jordan and I have had our ups and downs since R was born, but we are continuing to grow and learn together, and I just love it so much when we're all together. 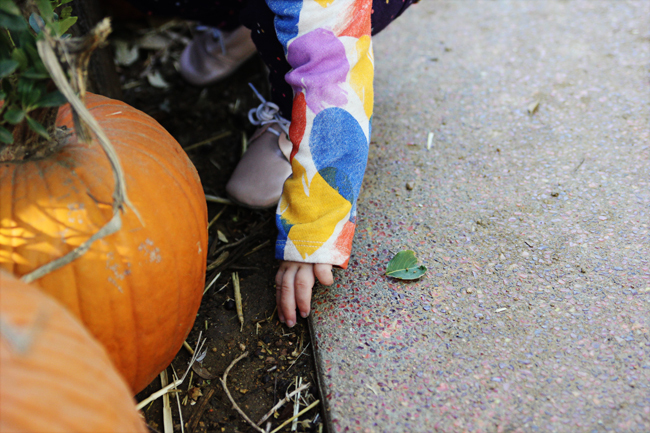 Thank you, Jesus, for Saturdays and fall and cute babies with pumpkins. Amen. You guys are adorable! I love what a little explorer R is!! That pumpkin wall with all the different kinds is really neat! I'd be curious about all those pumpkins! What a fun weekend! 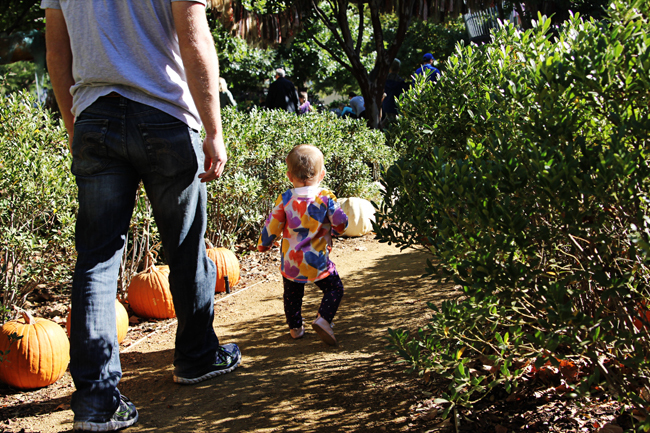 What a little cutie walking around on her own at the pumpkin patch like a big girl! Her bow is so cute!! Where did you get that one? I cant wait to do fun stuff like this. You really do have a sweet family. 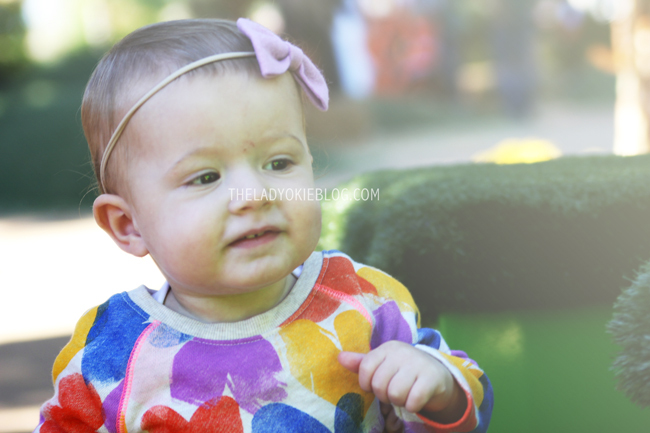 Thank you for sharing the beautiful times and the hard times on your blog! I We went to a pumpkin patch in Hawaii, which was fun, but it was not the same as back on the mainland. I'm glad you got to go out and enjoy some fall!! How sweet! We're going to try to do something like this tomorrow afternoon when James is off work, and I'm really looking forward to it. The three of us don't get much time together, and like you said, I love it when we're all together. Also--props to R for walking so well! G is still working on it. Facepalm. We haven't made it to a pumpkin patch this year.....or last year....my poor deprived kiddos. I think my favorite picture is the one with you two girls peeking your heads through the cut out photo thing. I'm a total sucker for those! That looks like so much FUN! I can't wait to finally get some "real" fall weather so I can enjoy, too! What a perfect day! R looks like she had so much fun! That pumpkin wall is really neat. I hope you guys have a fun Halloween! This looks like so much fun! We went last week and even though Jack is so little, I loved making those memories with Chris! cinderella pumpkin! i want! that wall of pumpkins is cool. this seems like a super fun day out for only $6 each. 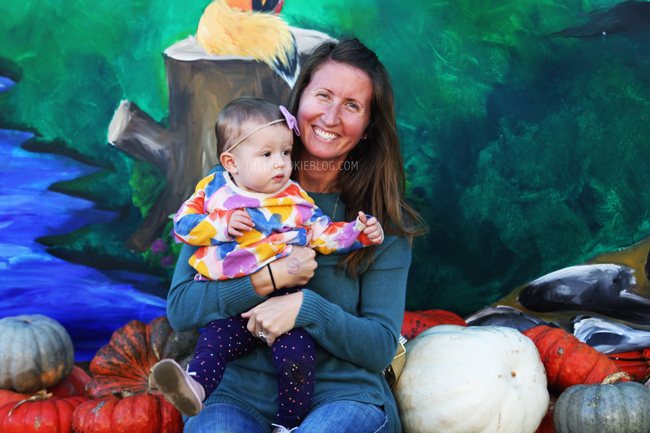 i am all about photo dumps if they include cute babies. 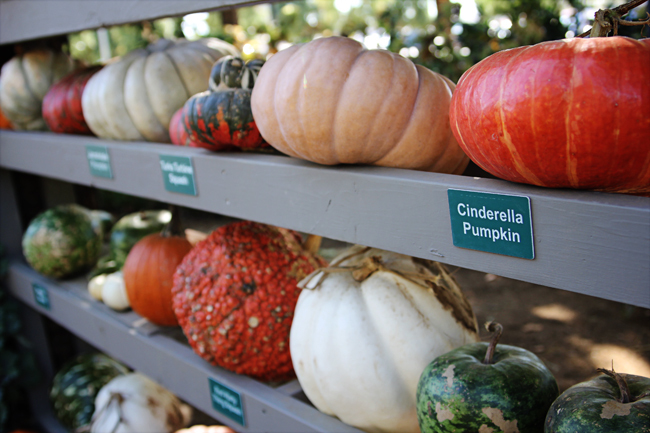 I love all the different kinds of pumpkins. Caleb and I were totally lame this year and didn't do anything Fall themed. Any free Saturday we got we basically decided to spend resting, which I'm not mad about either! ;) So fun you let R kind of guide the paths and see what she got so excited about. I love it! 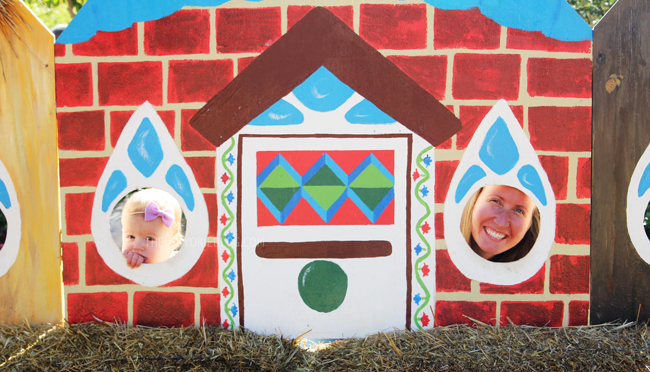 I would also be interested in that pumpkin wall with all the actual names of different pumpkins, but my favorite kind of fall place is anything with an awesome corn maze to get lost in. 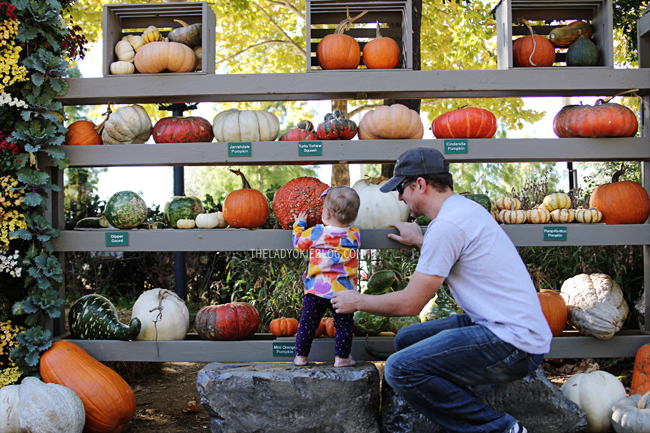 Oh, babies and pumpkins. They slay me.